We celebrated a special day last night, ooppss.. It’s not our birthday nor anniversary, it’s a special day because it 10-11-12.. Nice combination right?! Hello, minsan lang ata magkakaroon ng ganyan date, after 100 years na ulit.. Haha. Actually, Hubby and I always celebrates special “DATES”, it started way back 2008 - “08-08-08, “09-09-09”, “10-10-10”and “11-11-11”. Ang saya lang mag celebrate! Hehe. I bought a deal voucher from CashCash Pinoy - Only Php 250.00 for Php 500.00 worth of food and drinks at Capricciosa! Wow! Nice deal right?! So as soon as I read the terms and conditions, I didn't think twice. I got three vouchers and pay it via bank deposit. Yehey! Another food trip! Yum yum! This is my third time in Capricciosa, the 1st one during my former officemate treats and the 2nd was during our bloggers meet-up. I can say that Capricciosa really satisfy my cravings for Italian dishes. Capricciosa, an Italian restaurant that can be found at the second level of Greenbelt 3. The ambiance is simple; I love the interiors, table setting and the simplicity of their menu, very contemporary. There was no classical music playing in the back ground or even vintage portraits hanging on the wall. 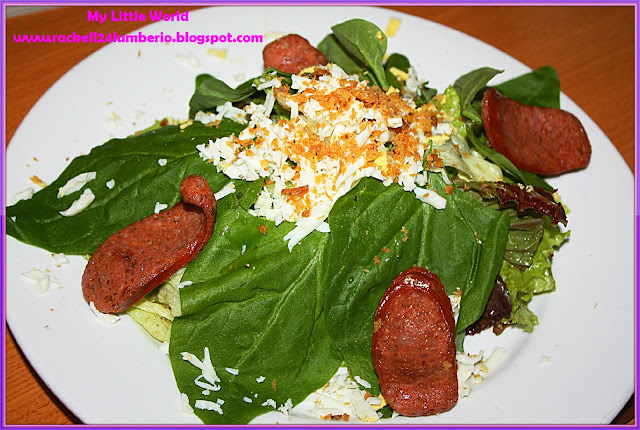 We really love salad for our appetizer, so we order for Spinach Salad – fresh spinach, pepperoni sausage and grated egg tossed in Italian dressing served on a bed of assorted lettuce. 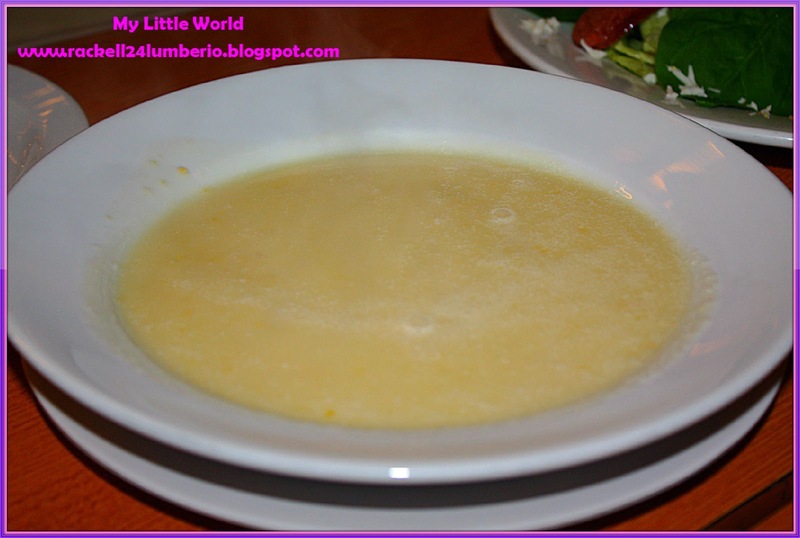 Since hubby experiencing upset stomach, he ordered for a soup – Creamy Corn Soup. The taste is like the crab and corn soup, mas masarap pa nga yun kesa dito eh.. Haha. 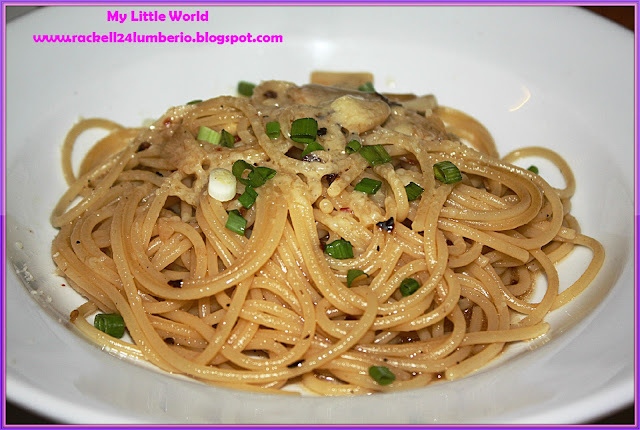 I chose to try the Aglio Olio Spaghetti – Spaghetti classic which sautéed in olive oil with a hefty portion of garlic and crushed red pepper, topped with Parmesan cheese and sliced green onion. 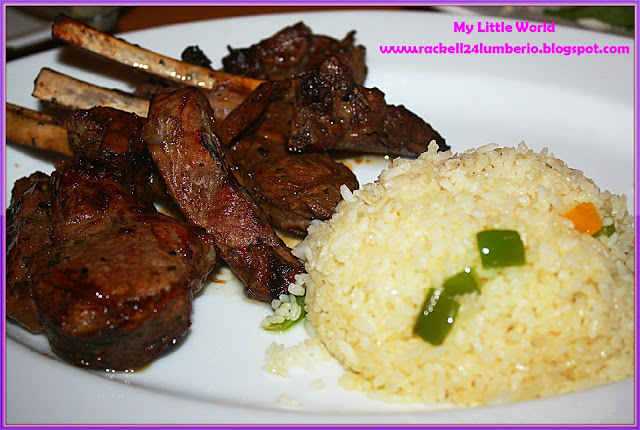 Hubby is craving for some grilled, so he preferred to order Grilled Lamb Chops – lamb chops marinated in their own very red wine, it is pan-grilled as per their menu. Yum yum! The lamb chops are hefty pieces of lamb grilled beautifully, matches well with your choice of rice pilaf, garlic toast, mashed potato, French fries or veggie. Their servings were quite generous and taste so good. Of course, our dinner will not be complete without having a dessert. 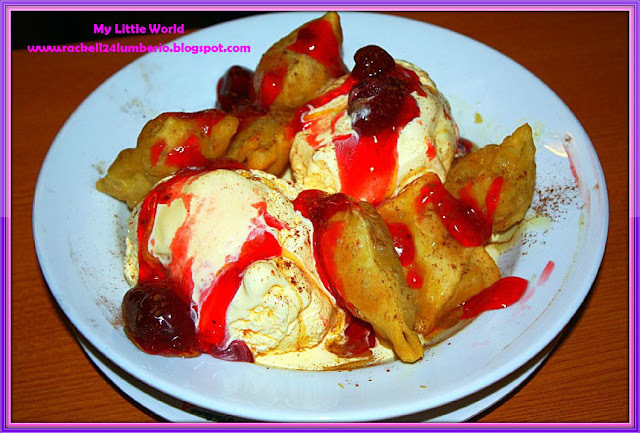 Hubby wants to try their specialty, the Frittori – freshly baked square-puffs deep fried until crispy served with two generous scoops of vanilla ice cream, drizzled with honey and cinnamon. After dinner, we just realized na sobrang dami pala namin nakain! From appetizer to dessert, bongang bonga! I can’t imagine how many calories ang na gain ko that night. Haha. Anyway, they got relatively reasonable price and nothing spectacular about the service. Thanks Cash Cash Pinoy for the deal! Yummy food. I love that frittori. I'm craving for ice cream no. I love reading your blog. Keep posting.